What has Evolution got to do with Metabolism & its disorders ? A lot actually. The basic philosophy behind dietary correction proposed on this blog, is that the ill-health of the modern world is largely due to not eating in the manner that we evolved to. Really speaking, ours is not a diet, but a Way Of Eating (WoE). There are many names by which variations of this WoE are getting to be known around the world. The foremost among them is “Paleo” a short for the term Paleolithic. We differ a little from the Paleo methods. Paleo does not allow for any dairy products, and permits fruits in abundance. But for the moment, let’s get a closer look into evolution and the reasons for promoting our way of eating & way of life. 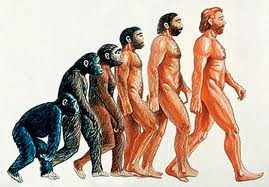 Anthropologists believe that the immediate ancestors of modern man (Homo Sapiens) were known as Homo Erectus (2nd from right in the illustration). They first spread from Africa and began to inhabit Asia, Europe & Africa approximately 2 million (20,00,000) years ago. The modern Homo Sapiens originated out of the Homo Erectus some 4,00,000 years ago. Biologically, the principal difference between the two species is that the modern man has a brain twice as large as that of our ancestors. Brains use a lot of energy. To increase size, our ancestors would have needed a lot of spare energy to be able to do that. The only way they could have probably done that was by eating a diet mainly consisting of meat. This also enabled them to reduce the size of their gut so that a lot less energy was expended in digestion and more of it could be spared for the brain. But by and large the other human bio systems remained intact and overlapping between the two species. We still have the same digestive system. Some 10,000 years ago modern man discovered Agriculture quite by accident. This happened in an area known as The Fertile Crescent (present day Egypt, Palestine, Syria, Jordan, Iraq, Turkey & Azerbaijan). It was a major boost to further development of our species. Growing food, released the pressure of hunting for food. The food uncertainty was erased, and it also ensured safety which was at stake during hunts. In a way, man became more ‘social’ and domesticated other ancillary animals which further improved food availability, on demand. But 10,000 years out of 20,00,000 is a mere half percent (0.5 %). So what were we eating for the other 99.5 % of our evolutionary history ? Since we moved in groups as hunter-gatherers our food consisted of animal and bird meats, seafood, insects and safe vegetative shrubs and fruits. And quite regularly there were periods of deprivation, when there was no food. Species evolve very slowly over very large periods of time. A small change in the body happens over thousands of years. But our food and eating habits have changed very rapidly. Bodily, we have not adapted to that change as rapidly. So there is a serious mismatch over what we were evolved to eat and what we eat. Our design has not changed but our fuel has. Our lifestyles have also changed drastically. Metabolically, that has created ill-health all over the world. There are very few and small scattered populations that still remain, in the wild, untouched by modernity. These populations display near perfect health parameters that are to be envied. Science & technology should have actually helped us overcome the dietary defects that we have acquired. But modern humans have been deprived of the best of health that science and technology should have delivered. Unfortunately, over the past century, the world of medicine, which is responsible for our dietary regimen, has got wedged in a vice like grip of the food industry on one hand and the pharmaceutical industry on the other. Big business and big bucks have meant that truth and science have both been suppressed. Greed, one of the seven cardinal sins has cost us dear. We, as a species, have lost the battle. Let’s hope we win the war.